The ivy bee Colletes hederae is a solitary mining bee, described as new to science in 1993, and it has been spreading northwards through the United Kingdom since it was first seen in Dorset in 2001. By autumn 2012 the most northerly records were from Cheltenham in Gloucestershire. It is the last solitary bee to emerge, appearing in late summer between late August and early November..
Society (BWARS) later confirmed that Andy’s photographs were of ivy bees and that the presence of males suggested breeding. At that date as far as we knew these were the only records north of Cheltenham, so the bee seemed to have skipped over Worcestershire. An appeal on the Worcestershire Wildlife Trust website failed to produce further records for the county, so on 28 September I examined flowering ivy in Wolverley churchyard in north Worcestershire. Although it was buzzing with drone flies and other insects, there was no sign of C. hederae. Then I struck lucky in a garden on the edge of the village and found a single female nectaring on ivy growing on a sunlit garden wall. In spite of further searches in the area, I found no others, so this could have been a pioneering female. This excitement was eclipsed a week or so later by Nigel Jones’ reports of C. hederae in Shrewsbury, an astonishing leap to the north-west. Next autumn, we should keep an eye out for this bee as it’s likely to consolidate its range in Worcestershire, continuing the northward expansion. 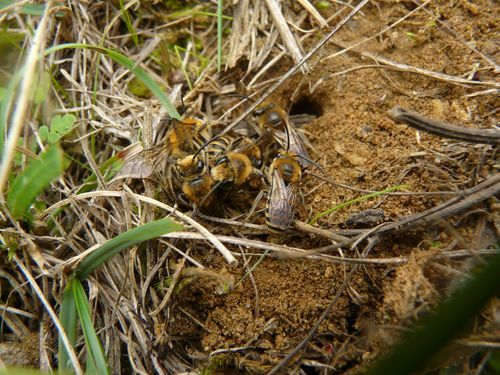 Colonies are usually very obvious with tumbling balls of males competing for the favours of emerging females. Some colonies have over a thousand nest-holes. Adults fly up to a kilometre in search of flowering ivy, so once seen, it’s worth looking between mid –September and late October on areas of sandy or friable soil, especially if south-facing and on a slight gradient. 01 Colletes hederae mating cluster. B. Westwood.